Encik Ahmad Zakiruddin Mohamed is the Senior Vice President, Operations - Engineering and Construction and Group Supply Chain in Sapura Energy. 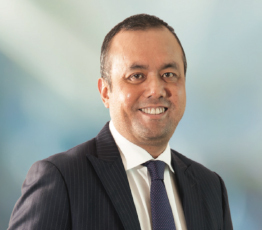 He joined Sapura Energy in 2012 as Vice President, Strategic BusinessSupport overseeing technical and operational strategic initiatives in the President and Group Chief Executive Officer’s office. Encik Zakiruddin started his career at Ranhill Bersekutu Sdn Bhd before moving to WS Atkins Consultants Limited, United Kingdom (UK) in 1999 as a mechanical engineer. He also worked in Detmarovice, Czech Republic under RMC Group PLC, UK before returning to Malaysia to rejoin the Ranhill group in 2002. During the period of 2009 to 2012, Encik Zakiruddin was the Chief Executive Officer of Ranhill E&C Sdn Bhd and Amona Ranhill Consortium Sdn Bhd. Encik Zakiruddin has 24 years of experience working in Malaysia, North Africa and Europe with exposure in a range of industries and sectors.